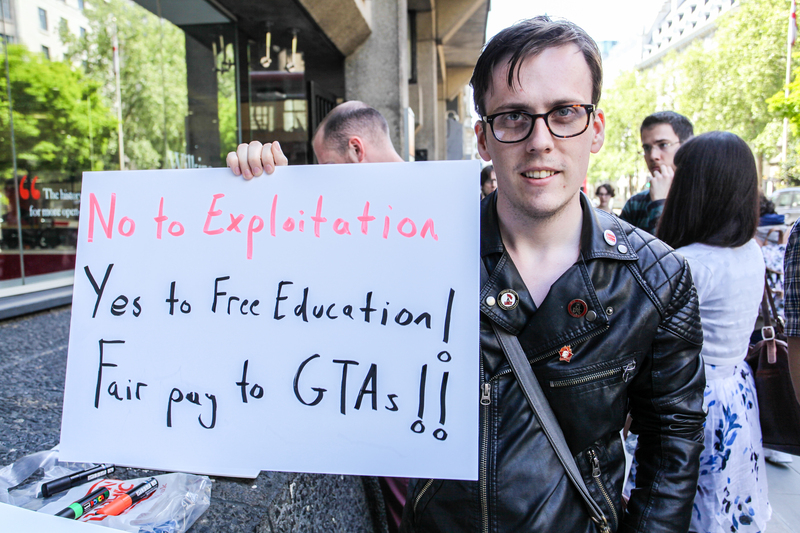 Copied from the GTAs at Kings College London blog here – please support the KCL GTA campaign! 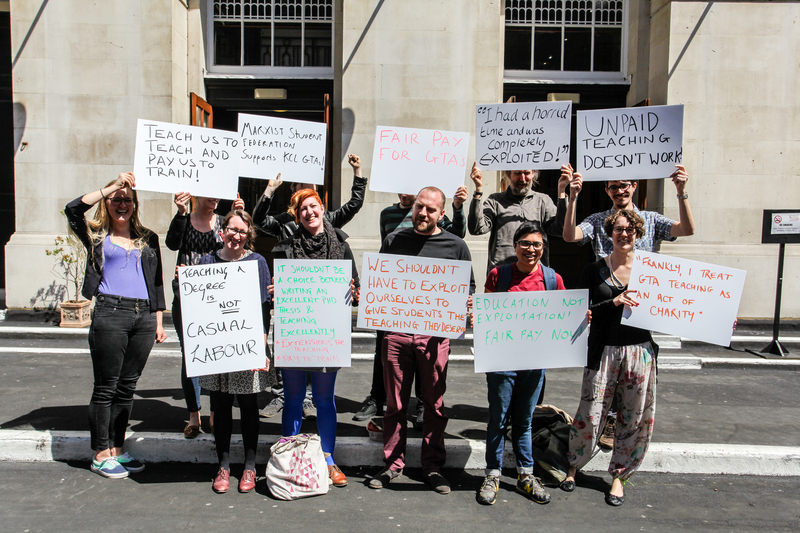 Graduate Teaching Assistants (GTAs) today issue a report detailing the exploitative working conditions they face at King’s College London (KCL). The report collates the responses to an online survey of over 400 graduate teaching assistants and PhD students at KCL in February 2015. The results present a damning picture of exploitation within the university, with 96% of GTAs working more than their contracted hours to perform their teaching duties (1). GTAs are now launching a campaign to demand fair pay for every hour worked. Preparation and marking are the worst areas for GTAs working unpaid overtime. When preparing for classes, 82% of GTAs work over their contracted hours to get the work done. When marking, 61% of GTAs work over their contracted hours to finish marking students’ work on time. 39% of GTAs feel that the amount of hours that they are contracted to work affects the quality of their marking, and 39% feel that it affects the quality of the feedback they can give to each student. My students cannot receive the standard of teaching or feedback that they expect or deserve, or that the university promises them, unless I consistently and persistently work extra hours for free. If I spend 90 minutes marking a bad paper then I end up getting paid £3.10 an hour. Since I can’t afford to work this way I compromise by spending less time, and offering less detailed feedback so the student suffers. Furthermore, as there is not time assigned for marking training, if we have not done it before we have to teach ourselves and have no guidance for whether we are doing it correctly or not (apart from being told to ask a colleague, which would eat into their time and they might not be willing and neither party would be paid). The papers need to be read quickly even to read them in double the time that is actually paid. The feedback needs to be generalised, to an extent, because there is no paid time to do them. Students are not getting the full benefits of learning in the course because of these issues. If I were to stick to the hours I was contracted for, I would prepare perhaps a quarter of the required reading per week and mark a third of the essays with reduced feedback. In case one sticks to the paid 6 hours obviously the quality of the teaching, the feedback to the students etc. breaks down to a low level. It cannot be of interest to KCL that that happens in case one really wants top teaching, top graduates and top reputation and everything for 9000 pounds per year. 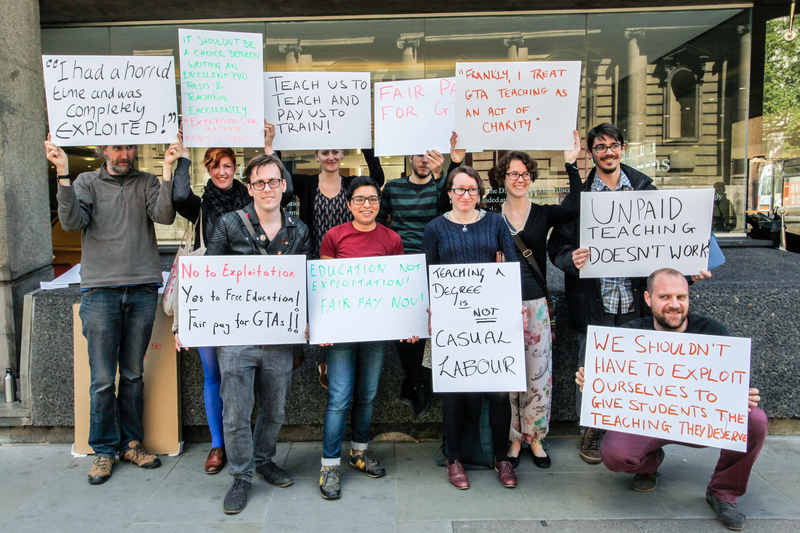 GTAs [graduate teaching assistants] and other casualised labour are used to cut costs – perhaps reducing the quality of students’ experiences, or perhaps just exploiting the GTAs. We are too often not used as ‘extras’ but as actual lecturers, yet without the fair pay or levels of experience. It’s not possible to mark a lab report in one hour. I have been doing this for 3 years now and got fairly fast and efficient with it and by now really do know my subject. But providing the student with helpful feedback while ensuring you mark the student fairly is not possible in one hour. I can barely check if his calculations and results are correct in the short time allocated for marking and feedback. It’s a huge amount of work which is appallingly paid. 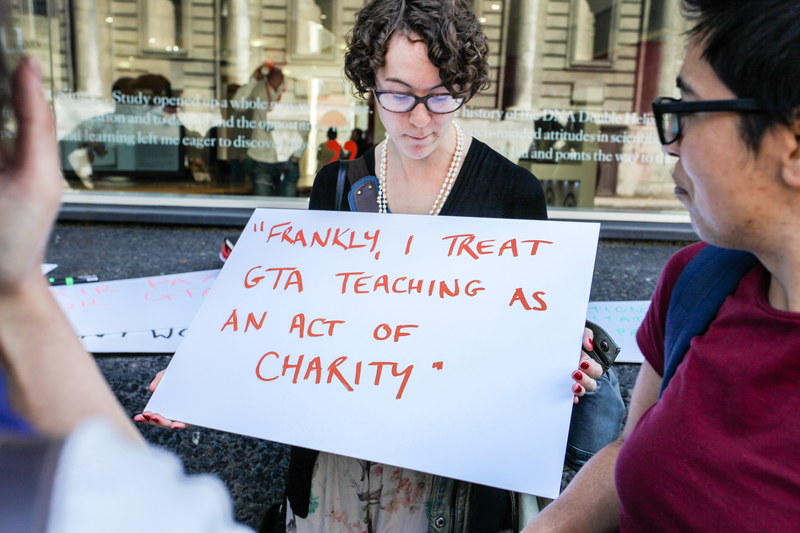 Frankly, I treat GTA teaching as an act of charity. It seems generally recognised that having the GTA attend the lecture they’ll be teaching on enables them to see things from the student’s perspective, address questions that come up, and generally do a better job of teaching the material. We’re only paid for one hour of preparation and doing each week’s reading takes at least two hours (on a good day) so many GTAs attend these lectures unpaid. Given it would result pretty quickly in a better student experience one thing that would straightforwardly help in my department at least would be paying the GTAs to attend these lectures. One hour preparation time is a joke in terms of how long it takes to teach material well. However, at least recognising this one form in which GTAs already go above and beyond and paying us for it would be welcome.